The incoming Labour-led government has much to do in its first 100 days and is unlikely to get much of a honeymoon period because of pressing issues landing at its door. 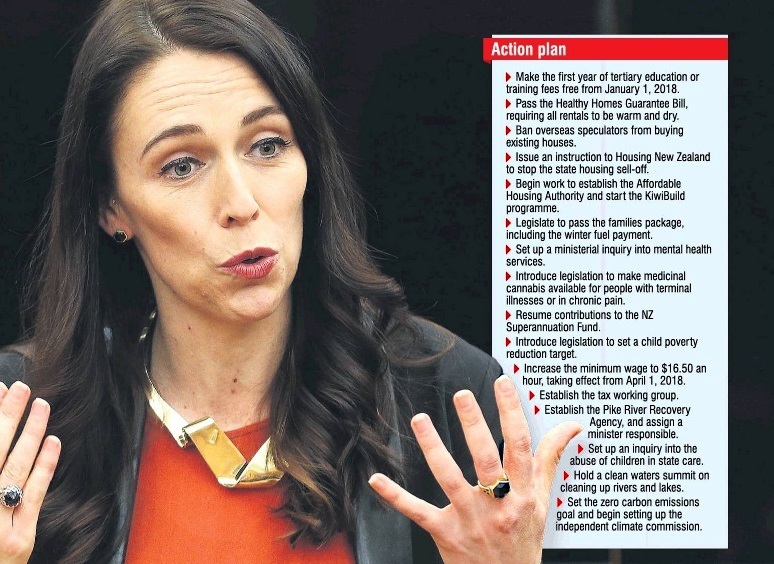 One major issue the Labour-New Zealand First coalition will need to confront is how it plans to meet some of its obligations on industrial relations. Trade unions are normally particularly hard on Labour-led governments. Not only do the unions financially and physically support Labour through their membership, there is also a feeling a left-leaning government needs to reverse industrial measures put in by previous National-led administrations. Prime minister-elect Jacinda Ardern plans to increase the minimum wage to $16.50 an hour from the current $15.75 an hour, to take effect from April 1, 2018. Also, she wants to pass the families package, including the winter fuel payment, to take effect from July 1. Council of Trade Unions secretary Sam Huggard told the Otago Daily Times he was keen to see signals in the first 100 days about a dedicated policy to lift wages for all people on low incomes. It was the new Government's role to provide a living wage for those workers. The minimum wage was an important issue but he was concerned about the problems all low-paid workers faced. Work had already been started with outgoing Workplace Safety and Employment Minister Michael Woodhouse on pay equity and Mr Huggard wanted that work to continue. Mr Huggard and CTU president Richard Wagstaff planned to meet the new Government to start talking about targets for workers. One of the main issues was Industry Standard Agreements, or Pay Equity Agreements, which would provide minimum conditions across certain industries, he said. These were not wide-ranging conditions, just a basic standard of care. Also, the CTU wanted changes made to improve collective bargaining, Mr Huggard said. The New Zealand Nurses Organisation was expecting a reversal of the 2017 ''Scrooge health budget'' and the $2billion going back to health. Acting chief executive Jane MacGeorge said health was the No1 election issue and a clear ''shout out'' to those standing to represent the public and run the country. ''It is only six months until this Government delivers its first Budget and we are looking forward to proper funding being available to ensure safe staffing levels and practices,'' Ms MacGeorge said. Many nurses said they believed cost-cutting was affecting the pace of recovery of their patients, she said. One of the other issues the new Government will need to deal with quickly is the TPP11, the Trans-Pacific Partnership without the United States. BusinessNZ chief executive Kirk Hope said business wanted clarity about what changes would be made to the TPP if it was implemented, and why those changes would be made. The TPP gave New Zealand exporters access to 450 million consumers worldwide. Outspoken TPP critic Jane Kelsey said the new Government would have to move fast if it was to influence the outcomes of trade and investment agreements being negotiated by National. There were at least five negotiations under way, all using the same broad template. Most urgently, the remaining 11 parties negotiating the TPP were meeting in the next few days in Japan on how to resuscitate the deal. Prof Kelsey said the new Government would have to agree on a position and brief its negotiators within a few days, not just on the TPP, and remember they all had called for greater openness. The meeting in Japan was meant to finalise options on the future of the agreements so their trade ministers or leaders could make a decision when they met on the margins of the Apec conference in Vietnam from November 5 to 11. That would put Ms Ardern and NZ First leader Winston Peters under the spotlight. ''They cannot deliver a new direction for the economy and greater control of our regulatory decisions, including on investment, unless they substantially change New Zealand's approach to these agreements,'' Prof Kelsey said.